What is the goal of physical therapy for people with arthritis? What are some benefits of occupational and physical therapy for arthritis? What techniques will I learn to treat arthritis pain? What therapy is offered for people recovering from joint replacement surgery? What joint protection techniques are offered to reduce stress on joints affected by arthritis? What are assistive devices? And how will they help me live with arthritis? Arthritis treatment may include physical therapy and/or occupational therapy. People with arthritis often have stiff joints -- largely because they avoid movements that can increase pain. By not moving arthritic joints, however, the stiffness and pain only get worse. Therefore, people with arthritis often benefit from physical therapy. A physical therapist can teach you how to work out stiffness without further damaging your joint. Physical therapy also is useful after an injury, such as from a fall, and after joint surgery, especially for artificial joint replacement. Occupational therapy can teach you how to reduce strain on your joints during daily activities. Occupational therapists can show you how to modify your home and workplace environments to reduce motions that may aggravate arthritis. They also may provide splints for your hands or wrists, and recommend assistive devices to aid in tasks such as driving, bathing, dressing, housekeeping, and certain work activities. What Is the Goal of Physical Therapy? The goal of physical therapy is to get a person back to the point where he or she can perform normal, everyday activities without difficulty. Preserving good range of motion is key to maintain the ability to perform daily activities. Therefore, increasing the range of motion of a joint is the primary focus of physical therapy. Building strength in the involved muscles surrounding the joint also is extremely important, since stronger muscles can better stabilize a weakened joint. Physical therapists provide exercises designed to preserve the strength and use of your joints. They can show you the best way to move from one position to another and can also teach you how to use walking aids such as crutches, a walker or a cane, if necessary. What Are Some Benefits of Occupational and Physical Therapy? You gain education about your type of arthritis, so that you can be well informed. If you are overweight, a dietary plan can be created to reduce the stress of excess weight on supporting joints of the back, legs, and feet. As yet, no specific diet -- other than a diet designed for weight loss -- has proved helpful for arthritis. You gain foot-care advice, including choice of well-fitting shoes with shock-absorbing outer soles and sculptured (orthotic) insoles molded exactly to the contour of each foot. You will learn therapeutic methods to relieve discomfort and improve performance through various physical techniques and activity modifications. What Techniques Will I Learn? Rest. Bed rest helps reduce both joint inflammation and pain, and is especially useful when multiple joints are affected and fatigue is a major problem. Individual joint rest is most helpful when arthritis involves one or only a few joints. Custom splints can be made to rest and support inflamed joints and a soft collar can support the neck while you are sitting or standing. Thermal modalities. Applying ice packs or heating pads, as well as deep heat provided by ultrasound and hot packs, can help relieve local pain. Heat also relaxes muscle spasm around inflamed joints. Heating joints and muscles with a warm bath or shower before exercising may help you exercise more easily. Exercise. Exercise is an important part of arthritis treatment that is most effective when done properly every day. Your doctor and therapist will prescribe a program for you that may vary as your needs change. What Therapy Is Offered for People Recovering From Joint Replacement? Preoperative programs of education and exercise, started before joint replacement surgery, are continued at home. They may be changed in the hospital after surgery to fit new needs during the rehabilitation period. These exercises may be added to your usual exercise regimen, and you may find your ability to exercise has improved after surgery. What Joint Protection Techniques Are Offered? Controlling your weight to avoid putting extra stress on weight-bearing joints such as the back, hips, knees, and feet. Being aware of body position, using good posture to protect your back and the joints of your legs and feet. When possible, sit down to do a job instead of standing. Change position often since staying in one position for a long time tends to increase stiffness and pain. Conserving energy by allowing for rest periods, both during the workday and during an activity. Respecting pain. It is your body's way of telling you something is wrong. Don't try an activity that puts strain on joints that are already painful or stiff. Using proper body mechanics for getting in and out of a car, chair or tub, as well as for lifting objects. Using your strongest joints and muscles to reduce the stress on smaller joints. For example, carrying a purse or briefcase with a shoulder strap rather than with your hand. Distributing pressure to minimize stress on any one joint. Lifting dishes with both palms rather than with your fingers and carrying heavy loads in your arms instead of with your hands. If your hands are affected by arthritis, avoid tight gripping, pinching, squeezing, and twisting. Ways to accomplish the same tasks with alternate methods or tools can usually be found. What Are Assistive Devices for Arthritis? If you have arthritis, many assistive devices have been developed to make activities easier and less stressful for the joints and muscles. Your therapist can suggest devices that will be helpful for tasks you may find difficult at home or at work. A few examples of helpful devices include a bath stool for use in the shower or tub, grab bars around the toilet or tub, and long-handled shoehorns or sock grippers. Your therapist can show you catalogs that have a wide variety of assistive devices. What is rheumatoid arthritis? 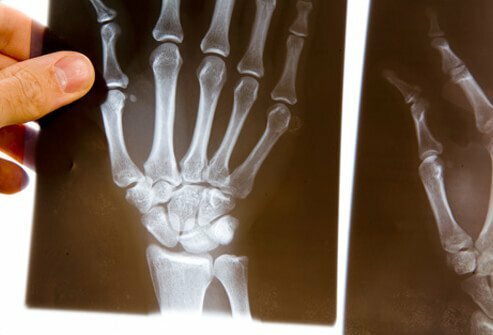 What causes rheumatoid arthritis? Is rheumatoid arthritis hereditary? Learn about signs and symptoms of rheumatoid arthritis, juvenile rheumatoid arthritis, diet, pictures, treatment, and other facts. Read more: Rheumatoid Arthritis Quiz: What is Rheumatoid Arthritis? Humira is indicated for reducing signs and symptoms, inducing major clinical response, inhibiting the progression of structural damage, and improving physical function in adult patients with moderately to severely active rheumatoid arthritis and other inflammatory conditions like psoriasis and Crohn's. Humira can be used alone or in combination with methotrexate or other disease-modifying anti-rheumatic drugs (DMARDs). Fatigue can be described in various ways. Sometimes fatigue is described as feeling a lack of energy and motivation (both mental and physical). The causes of fatigue are generally related to a variety of conditions or diseases, for example, anemia, mono, medications, sleep problems, cancer, anxiety, heart disease, and drug abuse.Treatment of fatigue is generally directed toward the condition or disease that is causing the fatigue. You can still have lots of fun with children despite arthritis. Our experts uncover ways to spend time with your kids or grandkids while you're moving by enjoying low-impact exercises to keep your joints flexible and your muscles strong. Osteoarthritis (OA) is a degenerative joint disease affecting both cartilage and bone. Joints most often affected by osteoarthritis include the knees, hands, back, or hips. Osteoarthritis symptoms include pain, swelling and joint inflammation. Stretch marks occur in the dermis, the elastic middle layer of skin that allows it to retain its shape. When the skin is constantly stretched, the dermis can break down, leaving behind stretch marks. During total hip replacement, diseased hip cartilage and bone is replaced with artificial materials. Risks of the surgery include blood clots in the lower extremities, difficulty with urination, infection, bone fracture, scarring, limited range of motion, and prosthesis failure. During total knee replacement surgery, the diseased knee joint is replaced with artificial material. The risks include blood clots in the legs, urinary tract infection, nausea and vomiting, chronic knee pain, nerve damage, and infection. A bone spur is a small, sharp outgrowth of bone. They can come from local trauma to the bone, cartilage or tendon near where a bone spur has formed. Inflammation, like that caused by arthritis, can also cause the formation of bone spurs. Often, bone spurs are not painful or uncomfortable. They only require treatment when they start causing pain or discomfort.